Submitted by Norm Roulet on Wed, 02/23/2011 - 17:56. You might not think a 65-year-old retired cop would take to the Internet to ask the president of the United States to consider legalizing drugs, but that's just what I did recently. The answer I got from President Obama in YouTube's "Your Interview with the President" contest pleasantly surprised me. 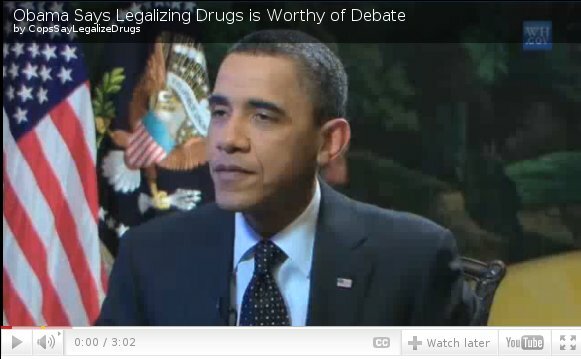 In stark contrast to when the president literally laughed off discussion of marijuana policy in a similar online question-and-answer session in 2009, Obama responded to me by saying that legalizing drugs is "an entirely legitimate topic for debate." Although he noted that he remains personally opposed to legalization for now, he acknowledged that "we have been so focused on arrests, incarceration, interdiction... that we don't spend as much time thinking about how to shrink demand." This welcome statement validated the viewpoint I developed over my 15 years of trying to enforce the drug prohibition laws. I began my career in law enforcement as a deputy with the Los Angeles Sheriff's Department in 1985. Later, I moved to Washington State to work for the King County Sheriff's Office in Seattle, where I worked in our most difficult neighborhoods as a patrol deputy and training officer. I also did a stint as an undercover detective making drug buys, running informants and writing and executing search warrants. I long ago lost count of how many drug arrests I made. You might think my attitude towards drug users would only have hardened over the years, but the opposite proved to be the case. Understand, I in no way condone or support the use of drugs. And crimes committed by drug users to support their habits must be punished as the crimes they are. What I came to understand, however, is that this is really a public health and education problem and must be addressed as such. I'm old enough to remember when doctors in white lab coats were on TV hawking cigarettes. It took a long time and a consistent public awareness campaign, but tobacco use in America is down dramatically. Can you imagine the mayhem had we outlawed cigarettes? Can you envision the "cigarette cartels" and the bloodbath that would follow? Yet, thanks to a public awareness campaign we've made a huge dent in tobacco use without arresting a single cigarette smoker. The "drug" problems our society is plagued with are, for the most part, actually drug prohibition problems, the result of a black market. We will never be able to legislate people away from self-intoxication. It's been going on since the first hominid ate a piece of fermenting fruit and got high on the alcohol content. All we succeed in doing by outlawing these substances is create a gargantuan black market for drug dealers and cartels. The illicit market is estimated to be a half-trillion dollars a year. For that kind of money you can by yourself a sovereign country and in some cases the cartels seemingly have. Mexico is engaged in, basically, open warfare with the cartels. The level of violence and brutality is unprecedented. If the colloquial definition of insanity is doing the same thing over and over, expecting a different result, what does that say about our "War on Drugs"? We've been pursuing this strategy for 40 years. It has cost a trillion taxpayer dollars, thousands of lives (both law enforcement and civilian) and destroyed hundreds of thousands more by incarceration. Moreover, it undermines the safety of our communities by overcrowding our jails and prisons, forcing them to give early release to truly violent offenders. So, in a country where, all too often, the only voices heard (or at least heeded) are those of large corporations or special interest groups with powerful lobbyists in Washington, I thought the president's YouTube forum might be a chance to pose a question directly to the person in charge. Long odds to be sure, but a chance nonetheless. Surprise doesn't begin to describe my reaction upon learning my video question ranked first place in the online voting and would be presented to the president. It is extremely encouraging to hear President Obama respond to a question about our national drug policy in a reasonable, respectful and serious manner, the first time a sitting president has done so. This is obviously a complicated, highly-charged issue, with Obama and many elected officials still opposed to legalization. But nothing will ever improve without first acknowledging the need for discussion. In that regard, the president's YouTube comments are a tremendous first step. We can only hope his words encouraging a serious debate on the topic prove to be more than rhetoric, and that he will take on the admittedly complicated challenge of revisiting and, hopefully, revising our national stance on drugs. MacKenzie Allen, a member of Law Enforcement Against Prohibition, is a retired deputy sheriff who did policing in Los Angles and Seattle.